Have you ever been to Lincolnshire? Many people haven’t. For a county that remains resolutely motorway free and is largely bereft of major, dual-carriageway trunk routes, it tends to be the sort of place you come to if you’ve a specific reason for visiting. Which is a pity, because as a county it’s spacious and countrified, with idyllic hamlets and villages, busy seaside resorts, twee market towns and a beautiful, cathedral city at its epicentre. 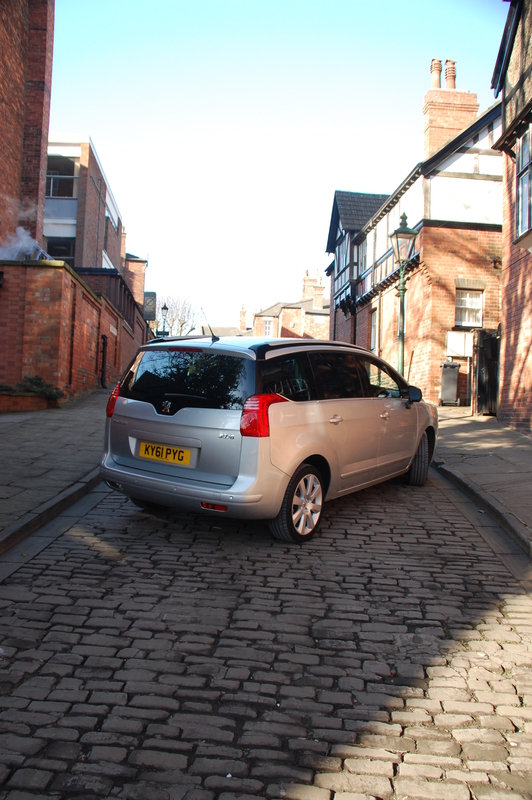 MPVs are the Lincolnshires of the motoring set. People acknowledge their existence but most will only consider buying one if they’ve a specific reason for doing so. Rarely are the words multi-purpose vehicle uttered with a lustrous mystique that invokes a craving from potential customers to pore over one at the nearest showroom. For some, MPVs represent nothing more than an opportunity for manufacturers to charge a price premium for a tall estate, or even worse, a van with windows. 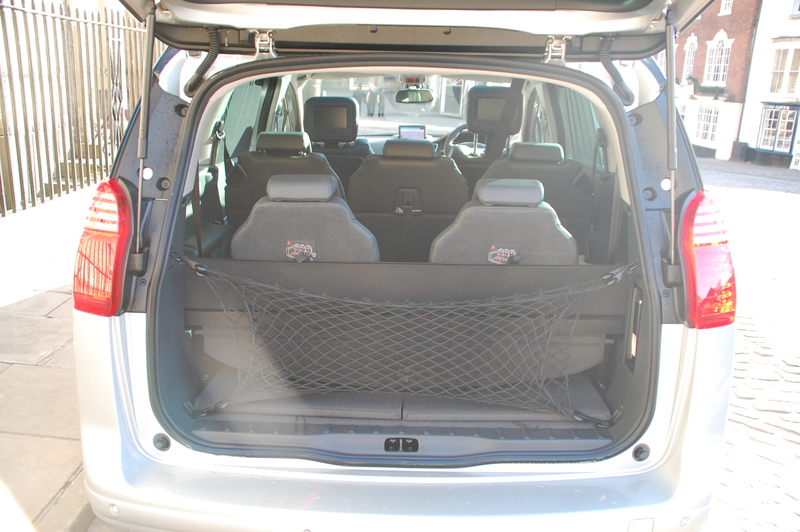 Such blinkered vision misses the point, for the reality is that for many families, MPVs are ideal methods of transportation for people and clutter – although rarely both at the same time. Peugeot’s 5008 is one of the newest entrants in the seven seater market, occupying the same territory that Vauxhall laid claim to back in 1999 with the Zafira. Like the popular griffin-badged MPV, the Peugeot features a third row of seats that slot neatly and easily into the floor, providing space for larger families in a relatively short footprint. But does it offer anything new to buyers in this hotly contested market segment? 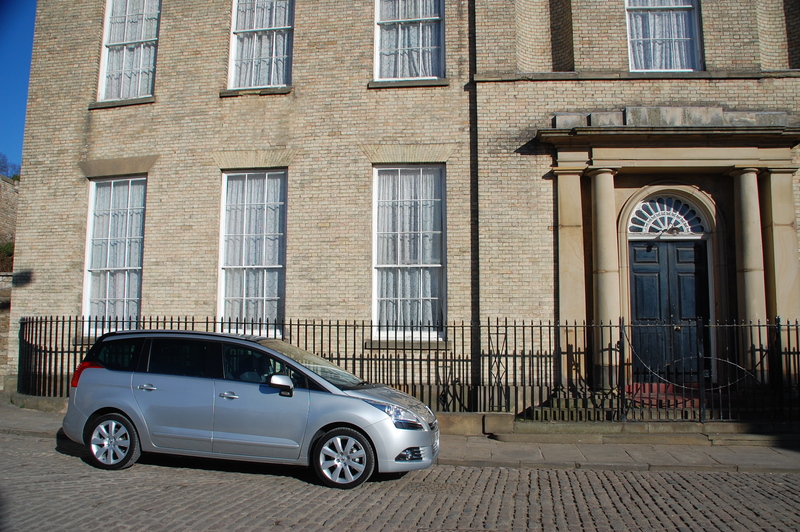 Aren’t these three-quarter sized MPVs a bit of a nonsense? The Zafira tapped into a section of the MPV market that provided the seven seats without the perceived bulk of the ‘full-size’ MPVs, such as Ford’s Galaxy, Renault’s Espace and Peugeot’s own 806 and 807. So popular has this intermediate size become that many brands, Peugeot included, have removed their bigger MPVs from the price lists. Peugeot was able to release the 5008 quickly due to component-sharing within the PSA Peugeot-Citroën empire, for under the bodywork lie the mechanicals and structure of its Grand C4 Picasso sibling. The 5008 manages to look different enough to be distinctive from its counterpart yet overall is a relatively flair-free design. Although some styling cues are shared with the chunkier, smaller 3008 model, the larger Peugeot eschews the majority of design trends witnessed on other models in the range. The chrome-tipped nose is relatively elegant but foregoes both the cheesy grinned grille of older Peugeots and the smaller, squarer interpretations of newer ones like the 508. Side on, it’s a good looking MPV in an inoffensive way, with its relatively smooth flanks being broken by a crease line that appears mid-way along the rear side doors. Above that, the window line flicks upwards at the rear, with a brightwork signature disappearing into a blacked out rear pillar, giving the impression that the rearmost part of the roof is floating above the cabin. The tailgate angle is particularly sheer to maximise interior space, offering little scope for visual interest to be arrested by a spark of creative genius, but the detailing breaks the monotony. Peugeot’s rampant lion (now so stylised it looks like a cartoon of a dancing man in a onesie) sits proudly on a blacked plinth where the rear screen glass dips into the metalwork, whilst the rear lamps look special at night. Tail lights of horizontal LEDs glow warmly like bars on an electric fire, with the indicators and brake lights illuminating from behind the gaps. Has Peugeot added sparkle to the 5008’s interior? Open the driver’s door and the cabin will feel immediately familiar to 3008 drivers, if not quite the same. The same, swooping Audi-esque slush moulding has been used for the majority of dashboard’s architecture but with some detail changes: the huge central storage bin has been replaced by a lower-slung one, with a sliding cover, whilst further up the centre console the passenger-side grab handle has disappeared and the expensive-looking bank of toggle switchgear has been replaced with flatter buttons. 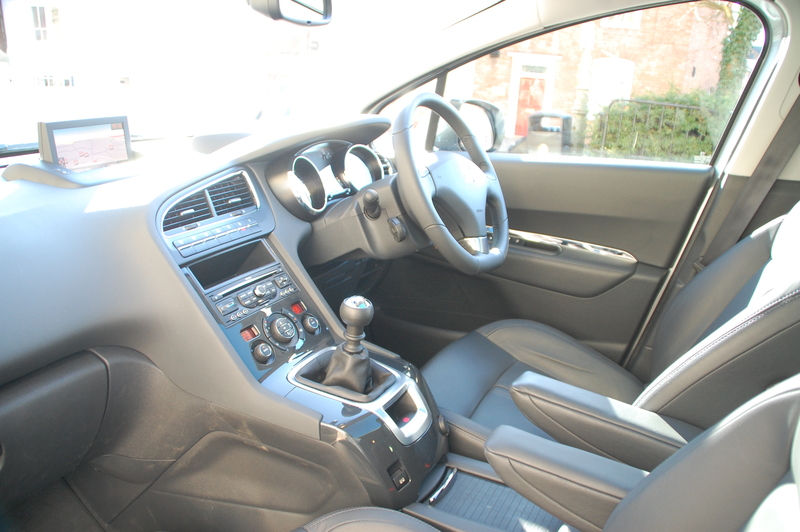 The changes sound minimal but have a sizeable effect in making the interior feel less aspirational and special. In the Allure specification sampled, the 5008 is well-equipped, featuring niceties like Bluetooth phone connectivity, iPod port, head-up display, leather seating, front and rear climate control, integral window blinds for the rear side windows and near full-length glass roof. Options fitted included an integrated satnav which looked fine but could be infuriatingly inaccurate as you can only enter the first handful of postcode digits and a rear seat entertainment package with screen inbuilt into the front headrests. Three individual chairs make up the middle row, each being ISOFIX child seat compatible and complete with a conventional three-point seat belt. One minor omission was the lack of a guidance feeders for the belts. In the middle seat this meant that the seatbelt could end up being stuck behind the offside middle passenger, rather than falling conveniently to hand. For the outer seats, the lack of a loop for the belts to slip through meant that every time the seats were slid forwards to permit entry to the third row, the belt would get trapped between the seat and the interior panelling. 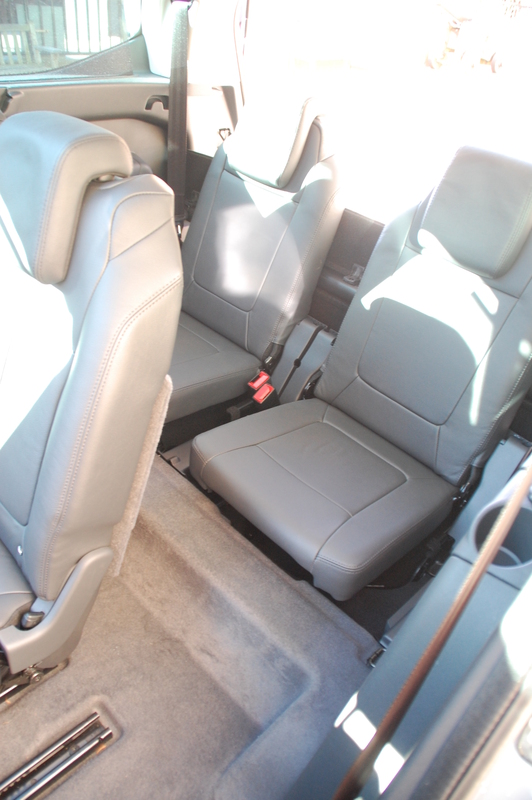 Over time the seat edge and the plastic interior will both get damaged – an easy flaw to rectify during a model year update. 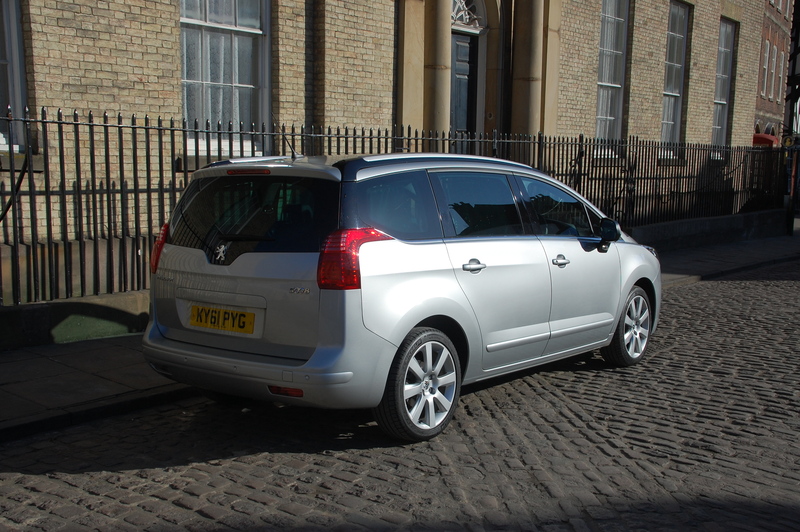 The third row of these intermediate MPVs is where the make or break usually occurs for larger families, because the 5008 is typical in that they’re designed primarily for children. They look comfy enough but my 6ft frame lamented the lack of room for my legs and head. 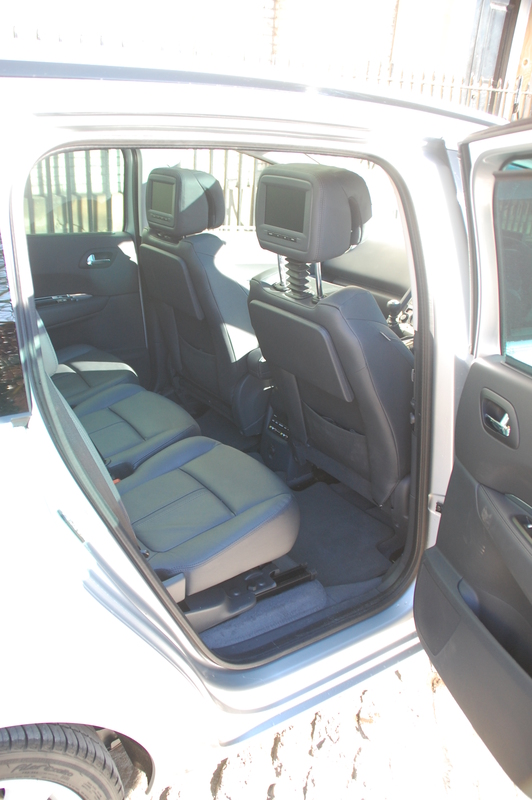 It’s also worth noting these seats are not ISOFIX prepared but they do fold flush into the cargo bay offering a huge, practical boot space with a low loading lip in five-seater mode. With the back row hidden away the Peugeot offers a generous 679 litres of space, possessions protected from view by a retractable tonneau cover. Capacity can be increased to a commodiously colossal 2506 litres with the middle row of chairs all slid forward. 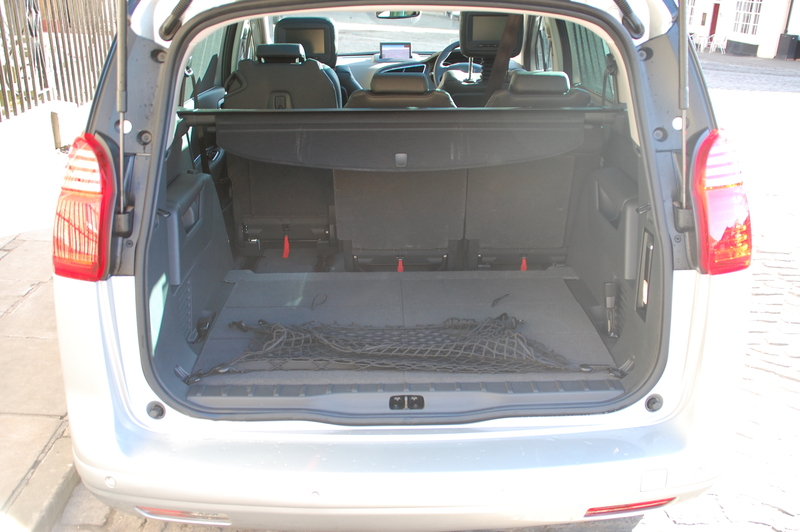 Peugeot conspicuously fails to quote a figure for luggage capacity with all seven seats upright and occupied. In real world terms, it’s tiny, big enough to carry three not-especially bulky carrier bags. The conundrum of carrying both a full complement of passengers and their possessions has not been solved here. Are there plenty of 5008’s to choose from in Peugeot’s range? Continuing the trend started in other models in the French marque’s line-up, you can buy the 5008 in Access, Active, Allure and pseudo-sporty SR trim levels, fitted with a range of petrol and diesel powerplants. 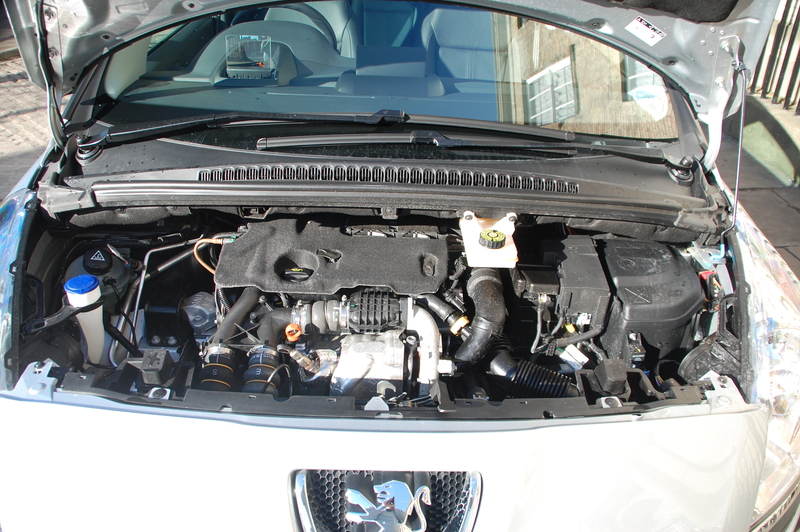 For petrol fans, the 1.6-litre four cylinder unit can be had in naturally aspirated (120bhp) and turbocharged (156bhp) forms, with manual gearboxes of five and six speeds respectively. Dieselphiles can have their HDi motors in 1.6-litre (112bhp) and 2.0-litre (150-163bhp) sizes, both available with automated gear changes. 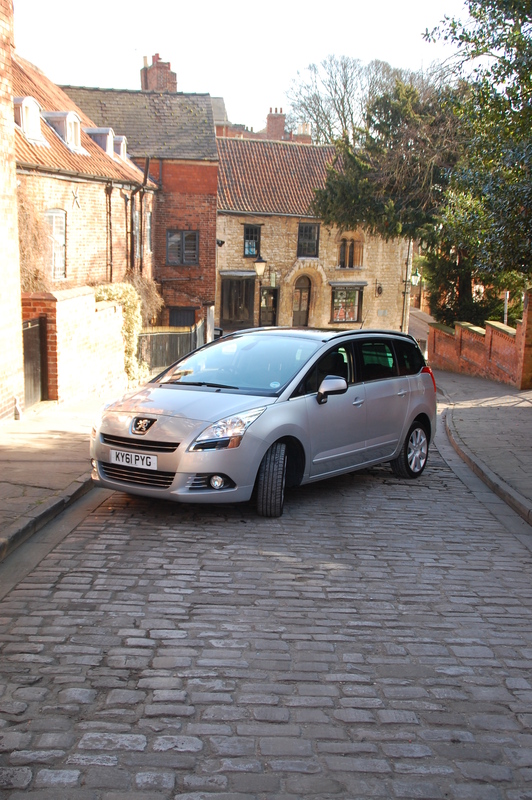 Prices for the 5008 kick off at £18,145 for the Access 1.6 VTi up to £25,295 for the top of the range Allure HDi 163 FAP with fully automatic gearbox. Loaded with seven people, a van-sized haul of cargo or a combination of the two, means that the 5008’s ride and handling compromise has been designed to cope with a potentially weighty payload. Surprisingly, this doesn’t mean that the chassis becomes bouncy and unwieldy when driven just one-up, the 5008 remaining composed and smooth, if not the most engaging of chariots to pilot. In spite of its high, vertical sides, the Peugeot also remains stable at cruising speeds, showing little susceptibility to cross winds: motorway sprints felt well within the 5008’s comfort zone, whereas winding across the Peak District in at on a weekend jaunt felt unrewarding. The steering, whilst not over-assisted, isn’t the most communicative but we’re back to the dilemma manufacturers face with this type of car: yes, it’s possible to make it more rewarding to drive but will that have a detrimental effect on ride comfort and consequently on the composure of passengers. How does the 5008 go? 112bhp doesn’t sound a lot to haul around seven people. The 1.6-litre common rail diesel engine does sound a little under-powered for a car of this size and frankly at times it feels it. Coupled to a six speed manual gearbox, it requires a fair amount of rowing of the gear lever to get the most out of its mild performance. Under normal driving conditions, it feels acceptably paced, getting up to motorway speeds with the general flow of traffic, but the engine lacks low end torque where you need it frequently. Most evident is the rolling to a roundabout or junction in second, spotting a gap and dipping the throttle to make the most of the momentum. The HDi unit’s lack of flexibility at low revs means it trickles out of the junction before eventually the torque surge kicks in just as you’re toying with slipping back into first. Similar things happen when driving in sixth: press resume on the cruise control when doing say 45mph and the engine doesn’t want to know unless you’re tobogganing down a decline, requiring a brief snick down into fifth (or even better, fourth) to regain the lost velocity. Whilst out and out performance isn’t the 112bhp engine’s forte, economy certainly is, even though this particular model wasn’t equipped with the Stop & Start system or the automated manual gearbox that accompanies it. Official claims of 51.4mpg were not just met but surpassed on test, with mid-50s being a regular entrant on the trip computer display. 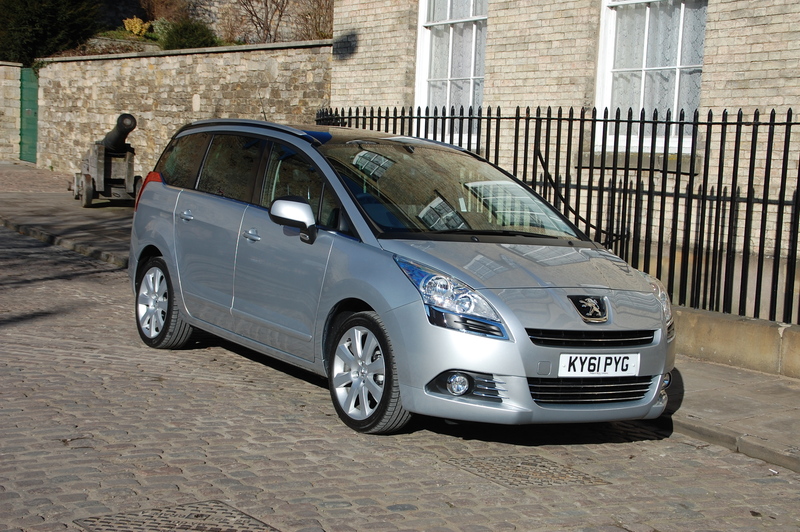 Peugeot’s 5008 doesn’t move the MPV game on in anyway, which is just as well because it doesn’t claim to. Its looks may be less voguish than many rivals but it also lacks much of Peugeot’s brand identity; remove the lion emblems and this could be a model from a number of manufacturers, which for a brand now regularly launching visually distinctive models is a sad state of affairs. That said, several who offered opinions cited the lack of the MPV-typical elongated triangle of glass just aft of the windscreen as a styling method that made the Peugeot look less bulky than many rivals. The resultant obvious angle between bonnet line and windscreen make makes it look more of a taller estate than a monovolume people carrier. Peugeot 5008 ownership will reward you a solidly built body and robust, quality interior, spaciousness and a comprehensive range of features in Allure specification. But it does little to excite, either visually or as a driving experience and in a world that’s already familiar with the, admittedly larger, Ford S-MAX, that’s got to be a missed opportunity. Buying an MPV is different from buying the majority of other cars because the practicality, flexibility and usability of the interior almost always ranks considerably higher than the way it looks or drives. And the 5008 will prove, for many families to be a car capable of fitting their very specific needs. Combined with its virtues of being tough and economical, it adds up to a potentially compelling package. Just don’t expect to find desirability on the standard features list.